I recently bought the William Optics FLAT 6A II, and finally made it out under the stars to take some sub-exposures. I paired it with my GT-81 and ZWO ASI071MC color CMOS camera. The FLAT 6A II is a 0.8x reducer/field flattener; it's adjustable for different focal lengths, and so far, with my limited use, it appears to be quite a leap over the old William Optics F6-A I've used for a few years. The ASI071 has an APS-C sized sensor, and anyone with a large sensor astro camera or DSLR knows if you don't want field curvature with your refractor you need some sort of flattener. 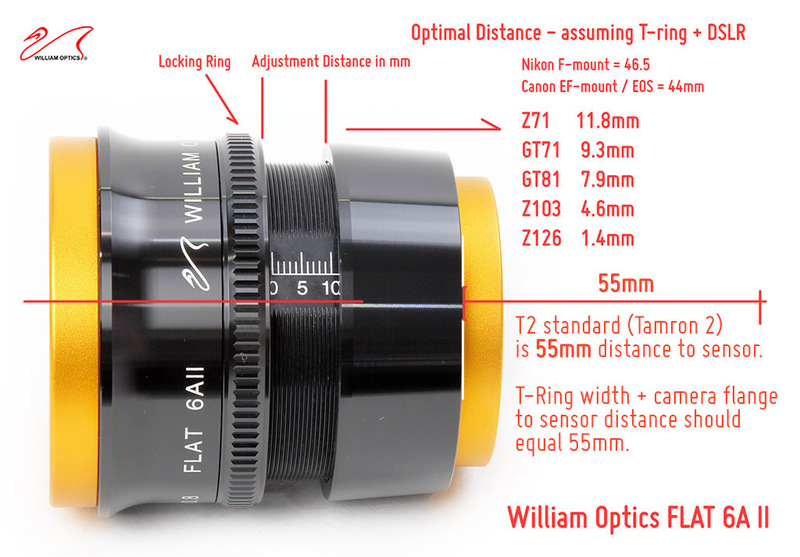 The FLAT6AII design makes it easy to dial in the correct distance for the scope you're using. The old reducer/flattener worked, but I had to test out a dozen different flattener to sensor distances, and still had to do some cropping and processing to fix the corners. This new FLAT 6AII provides a fairly flat field across the entire view. 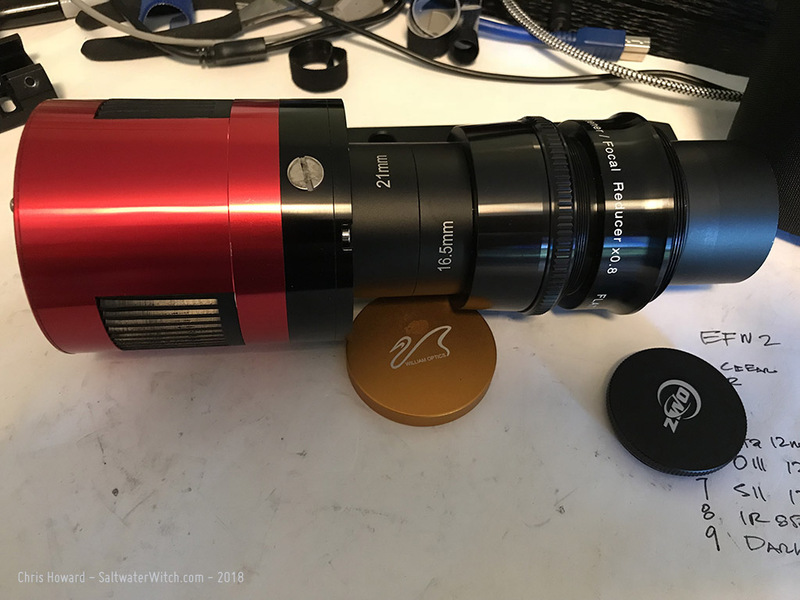 Equipment: William Optics GT-81 + FLAT 6A II 0.8x reducer f/4.7, ZWO ASI071MC-Cool color CMOS camera - gain 0 offset 8, ZWO ASI120MM-S Guide Cam + 130mm guide scope. With the GT81 and ASI071 I get a 3.54° x 2.35° field of view, and I can capture some big chunks of the night sky. Here are three from the last two nights:  the Pelican Nebula (IC 5070) and the edge of the North America Nebula (NGC7000) at the bottom,  IC 1396 nebula with the Elephant's Trunk at the top and the Garnet Star bottom left, and  M31, our galactic neighbor, the Andromeda Galaxy. The Andromeda Galaxy. 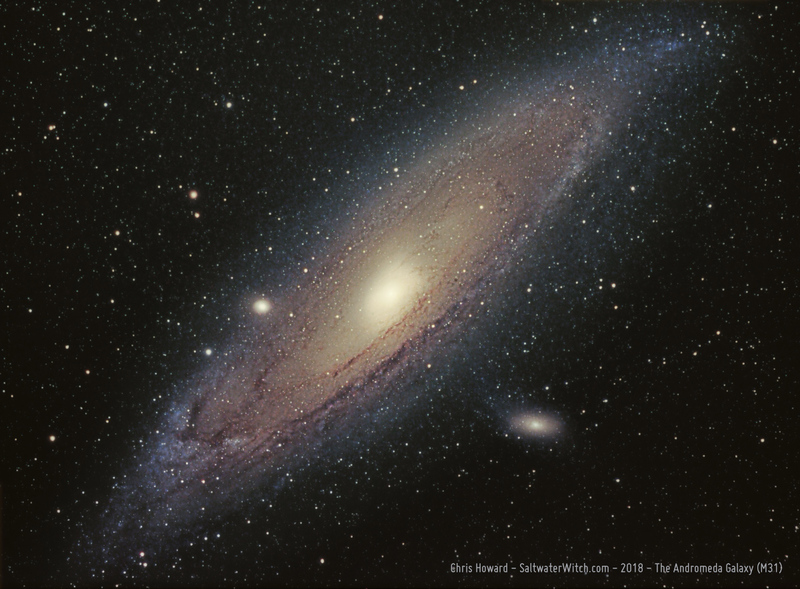 The last time I photographed Andromeda (M31) was 2015, maybe fall of 2014? It's been a while. I was using a DSLR--that was the only camera I had, and I had it on a terribly-used Celestron CG-5 equatorial mount with some aftermarket RA/DEC motors. By "terribly-used" I mean you could drive a truck through the gear backlash. Even so, I still managed to get some decent 30-second exposures of Andromeda, Orion Nebula, and other big bright targets in the sky. Well, I'm back with our galactic neighbor, and with much better gear: 192 x 120-second sub-exposures stacked in DSS, processed in PSCC2018, ZWO ASI071MC camera at -10C, William Optics GT81 APO, iOptron CEM25P EQ mount. Our galactic neighborhood, looking toward the center, with 13 stacked 15 second exposures, Nikon D750, Rokinon 10mm f/2.8 lens. What's crazy is this is with a decent DSLR camera, lens, a tripod, and some free image stacking software (DSS). I did the stretching in Photoshop CC--"stretching" is when you adjust contrast, intensity values, to bring out the features of whatever you're shooting--in this case the north end of the Milky Way Galaxy, our home. Let me point out some interesting features: starting at the left, that vivid red star is the "Garnet Star" (Mu Cephei), and that's right next to some cool nebulosity that includes the Elephant's Trunk Nebula (IC 1396), a little ways along, you see that blocky reddish region? 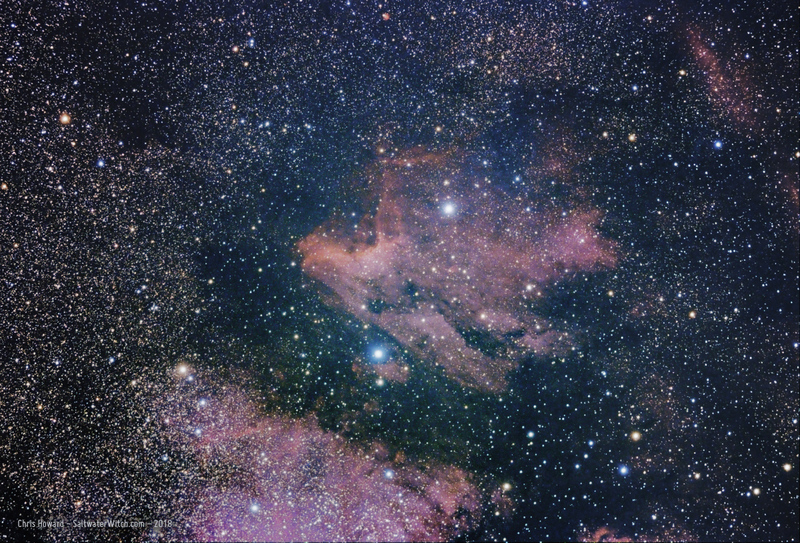 That's the North America Nebula (NGC 7000) with the star Deneb (19th brightest star in the night sky). Deneb forms the northernmost (leftmost in this shot) point of the famous "Summer Triangle". 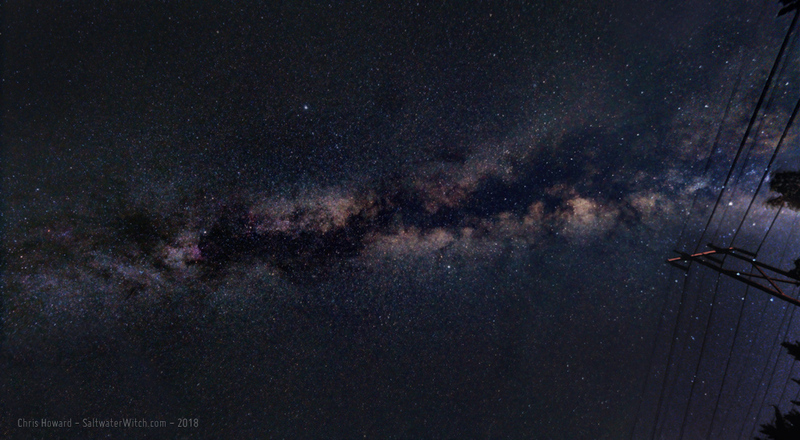 The other two points are Vega, the 5th brightest star in the night sky (to the right and above the Milky Way core in this shot), and Altair (12th brightest) a little more to the right and below the Milky Way core. Moving along the galaxy to that bright region on the bottom side of the core, about halfway between Altair and the powerlines--if you really zoom in, you'll see the Wild Duck Cluster (M11). Now look just left of where the powerlines cross, those grayish-pink cloudy areas? 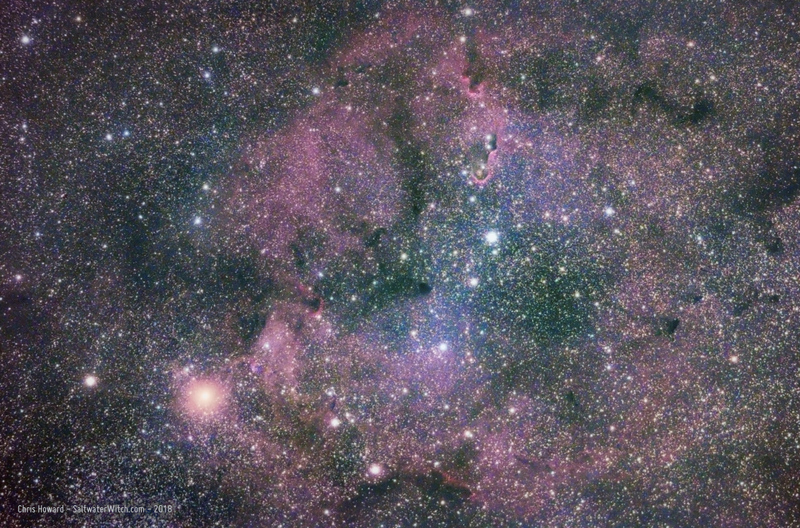 That's where you will find the Eagle Nebula (Messier 16, NGC 6611) and the Swan Nebula (M17). That bright point of light in the middle of the powerlines is the planet Saturn, which is moving along the ecliptic and right now it's in a pretty good place for viewing. Just right of that are a few more cloudy areas. That's where you would look for the Lagoon Nebula (M8, NGC 6523) and Trifid Nebula (M20, NGC 6514). Somewhere along the Milky Way--this is where you will mostly likely find me focusing my telescope all the through the summer and fall. I almost see this shot as a map of places to visit from afar, and the cool thing is you really don't need to setup the astro gear for this. You can create your own galaxy map, as long as your camera can handle long exposures (not that long, only 15 seconds) and you have it on a tripod with a remote shutter control. And this is only part of the sky from where I'm standing on our little planet! Another way to put this image in perspective is here in the northern hemisphere, around 43° latitude, I don't have enough of a view south (blocked by hills and trees) to see Sagittarius A*, which marks the center of our galaxy, and this far north there's a sky full of other galaxies, a large section of our own galaxy, nebulae, and other deep space objects that I can't ever see from here--that I would have to travel below the equator to see. Some day! 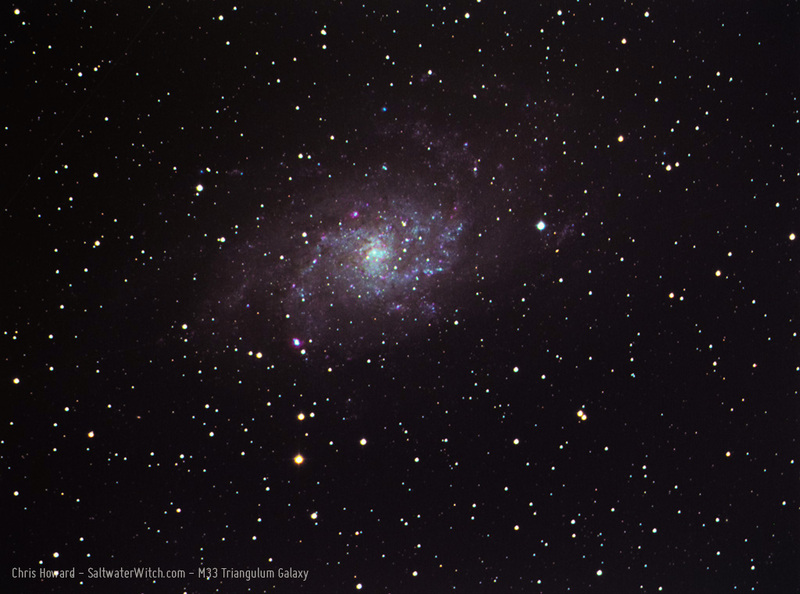 M33 Triangulum Galaxy, about 3 million lightyears away, so... not that far. M33 is a relatively small spiral galaxy with only 40 billion stars. I'm having some trouble with my guide camera (ZWO ASI120MM), so this is all unguided. I took 80 LRGB exposures--120 seconds each, 10 Ha frames at 120 secs, 20 dark calibration frames, stacked in DSS). 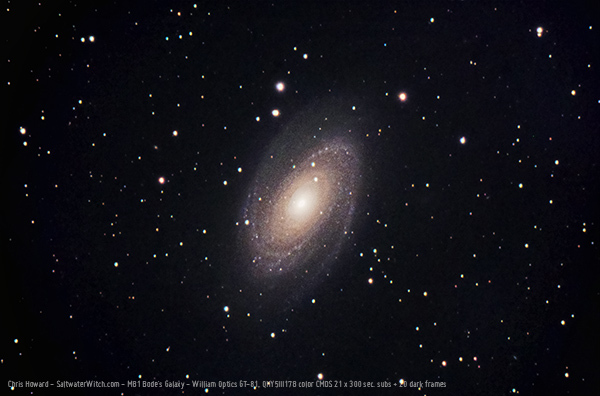 Color version of M81 (Bode's Galaxy) in the constellation Ursa Major (Big Dipper). From another set of subs I shot at 4am--this time with the color QHY CMOS camera, QHY5III178. Info: 21 x 300 sec. with 20 dark frames, QHY5III178 color CMOS, William Optics GT-81, CEM25P EQ mount, WO 50mm guidescope with ZWO ASI120S-MM guide cam, INDI/KStars/Ekos observatory control. 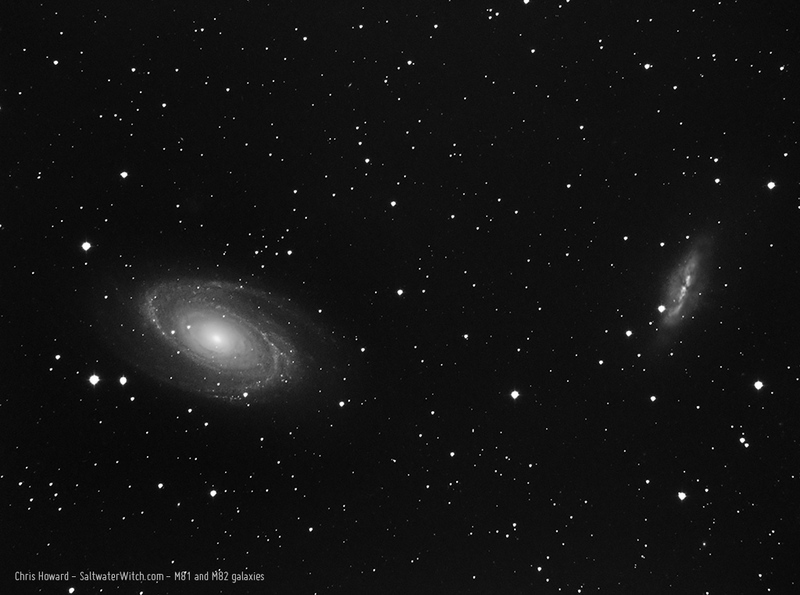 M81 (Bode's Galaxy) and M82 (Cigar Galaxy) in the constellation Ursa Major (Big Dipper). I was up at 4am, and there's the big dipper swinging around and climbing into the sky. Bode's and the cigar galaxy were just waiting to be captured. Info: 15 x 120 sec. with 10 dark frames, Atik414Ex mono CCD, William Optics GT-81, CEM25P EQ mount, WO 50mm guidescope with ZWO ASI120S-MM guide cam, INDI/KStars/Ekos observatory control.